and vibrations of a subway ride. Pieces selected for "Drawing is Another Kind of Language," now on view at The Contemporary Museum, reflect many artists' takes on the two basic facts of drawing: the mark and the surface. A wide variety of styles and drawing media are reflected. 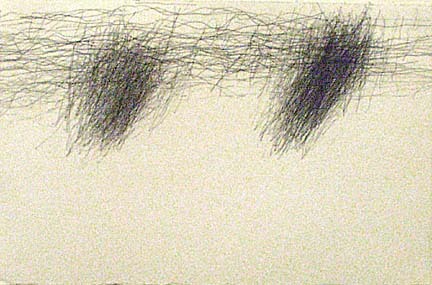 William Anastasi took a chance on art in the late 1970s during monotonous rides on the New York City subway. He took to a new way of drawing -- without looking. With his arms rigid and bent at the elbows, a drawing board in his lap, and a pencil in each hand, Anastasi sat like a robot and allowed the motions of the subway train to take over. His drawings became compilations of lines that are messy records of the train's starts and stops, accelerations and decelerations. His endeavor was art of a new order -- a new kind of language -- inspired by his friend, music composer John Cage, that employed chance as a method of creating art. 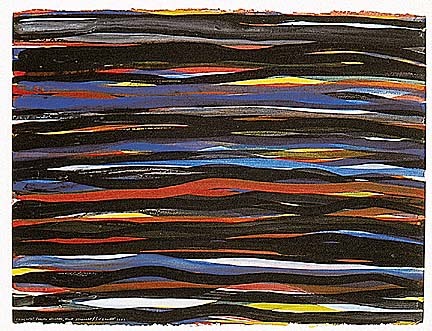 Sol LeWitt's "Horizontal Brushstrokes, Not Straight," gouache on paper. 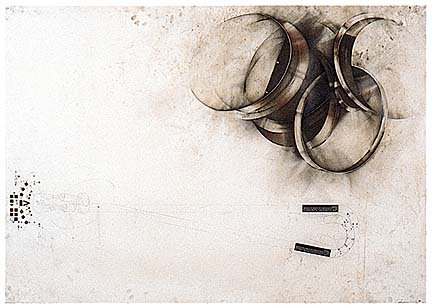 Far from antiseptic results, Anastasi's "unsighted" drawings are dynamic. They are not mere seismograph readings, but expressions of the physical making of art, an idea that has taken root in the art world. Chief Curator Jay Jensen calls the exhibit significant, a substantive collection by a wise collector, and the first time such a collection is being shown in Hawaii. The show is organized by Harvard University Art Museum in Cambridge, Mass., and has traveled to Switzerland, Germany, Austria, France, New York and Chicago. Hawaii is its last stop. 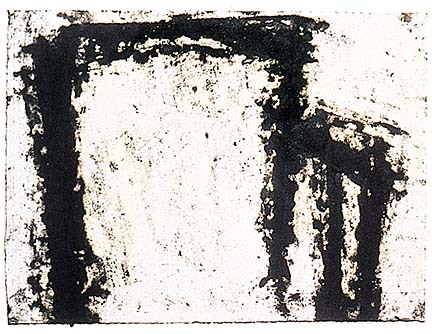 paintstick on German etching paper. "This is the best collection of its kind in America," Jensen said. "Some of the significant features that give this exhibit great strength are the representations of some major American artists," such as painters Jasper Johns and Ellsworth Kelly and sculptor Richard Serra. But the works by lesser-known artists also represent important contributions to contemporary art, Jensen said. "It's the inclusion of the lesser-known artists with the well-known artists that also gives the show strength." Whether the artists are American icons or not, the drawings represent important aspects of American contemporary art, ranging from abstract expressionism to minimalism to conceptual art, Jensen said. The exhibit is a reflection of collector Warner Kramarsky's mission. Kramarsky has gathered about 2,000 drawings in more than 40 years, and 100 of them are being shown at the Makiki Heights museum. Kramarsky, Jensen said, is a private man who prefers that his art collection get the limelight. He flew to Hawaii for the opening of the exhibit but did not wish to be interviewed. pigment and transfer type on paper. Kramarsky worked in the financial world and is retired but still devotes much of his time to seeking out the best in American art, works by obscure artists with potential to gain critical acclaim. "He wants to nurture art by young artists," Jensen said. "He didn't want to go buy drawings at the auctions (where the art is by established and often dead artists)." According to the Harvard organizers, Kramarsky never fell victim to the fashionable but conformed to his own "sophisticated and highly principled taste for the abstract, the geometric and the minimalist." He collected with "an eye for the freshness and integrity of the individual drawing." Kramarsky's principled method resulted in a collection valued not only for its famous artists but also difficult-to-find works, Jensen said. For example, the exhibit includes five drawings by Eva Hesse, an accomplished artist who died young of a brain tumor. Because of her shortened career, Hesse's work is rare, and this exhibit offers an unusual opportunity to see the work of a woman regarded as a forerunner in minimalism.